Here are five tips to create a bedroom to delight your little (or not so little) ray of sunshine. 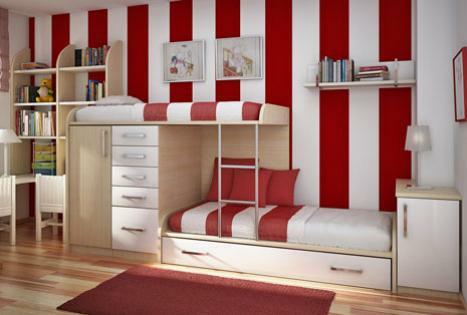 It’s no longer simply blue for boys and pink for girls when it comes to children’s rooms. Think outside the square and embrace some new not-so-predictable shades. A playful red tone is a hit with both genders, while a fresh colour like citrus will see a child through the tweens into late teenagehood. If you’re not sure about making such a bold statement, remember a feature wall is a great way to inject some colour into a room while still playing it safe. Remember it’s not just walls that look all the more stunning with a fresh coat of paint. Raw pine furniture, such as bookcases, slat beds and bedside tables, are an inexpensive alternative to pre-coated furniture, plus they allow you to coordinate your furniture with your walls and the rest of your decor. You can even make a statement piece out of an otherwise ordinary object. Simply prepare the furniture with an undercoat like Dulux 1 Step Acrylic Primer Sealer Undercoat and finish off with water-based enamel that will cope with bumps and scuffs, such as Dulux Aquanamel. A child’s room is a great place to demonstrate the full scope of your creativity (or your child’s, if you’re feeling brave). You don’t need to be a trained artist to paint a mural with a fun kids’ theme. Look around at books, magazines and the internet for inspiration and then practise your design on paper until you get it just right. You can then map out your artwork on the wall using a soft lead pencil (with an eraser at the ready), before getting out the paint. Speak to the paint experts at your local store about which paints will work best for the mural and what you can use to seal your work of art when it’s finished, to protect it against any rough treatment. For wall art that is simple and quick, you can’t go past removable stickers or decals for children’s rooms. Because they’re removable you can easily peel them off and reapply them if you put them in the wrong spot; or change them altogether if your child has outgrown his farmyard theme and wants to move onto spaceships. Afterwards, your walls will be left unmarked, with no clean up required. All kids seem to have at least one attempt at drawing on the walls, to the horror of their parents. These days, parents can relax when they’ve used a paint with high washability and scuff resistance. Simply wipe the wall with a damp cloth to remove the offending sketch; or beat your budding Picasso at his or her own game by including a chalkboard section to their wall. If your little one likes working on a large scale you could paint an entire wall or you may prefer to paint smaller chalkboard shapes (such as hearts, stars or balloons) to create a more decorative effect. Simply make sure you use a soft lead pencil to sketch the shape before applying the chalkboard paint.